Planning a corporate event/ tradeshow and you need something out of the box to grab attention? Got you covered on that and a one of kind luxury piece to auction off. Thank you for watching and please "like" and "subscribe" to my channel! *Follow me on social media for daily posts on the art and my live event painting travels. 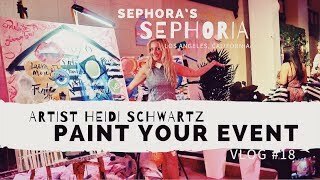 Live Event Artist Heidi Schwartz...I made this all up. Do I know what I am doing? Nah, I'm just feeling my way through. Here's my bird's eye perspective on live event art life. Live event painting the Grand Opening of the newly renovated Hilton Hotel in downtown Birmingham, AL at UAB. The EXTRA fun ribbon cutting coupled with the UAB marching band and cheerleading squad made this a lively event to capture on canvas. And this piece might be one of my favorites yet! Energy, great design and a youthful pep... all makings for a magical time to uniquely encapsulate into a painting. Congratulations to the beautiful UAB Hilton Hotel! 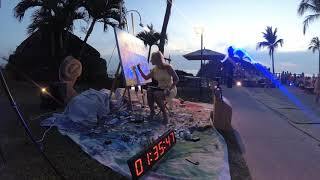 Artist Heidi Schwartz of Paint Your Event travels the globe to capture events live on canvas! Hi, my name is Heidi and I'm a live event painter. I travel to events to capture them LIVE on canvas, anything from fundraisers, corporate events, weddings, and galas. I create a space where performance art and fine art coexist. I have been privileged to travel the world, painting everywhere from New York to Los Angeles, Victoria Island in British Columbia to South Beach, and even as far as Sydney Harbor in Australia. 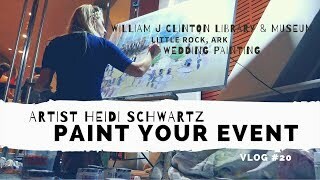 Live painting a wedding at gorgeous national treasure the William J Clinton Library and Museum in Little Rock, Ark. It was a December wedding so all the festive colors were around making this event a special & colorful treat. The result is an abstract, original work of art that captures the specialness of the wedding day and celebratory time of year. Congratulations to the happy couple!!! HEIDI SCHWARTZ is my name and PAINT YOUR EVENT is what I do. What is PAINT YOUR EVENT? 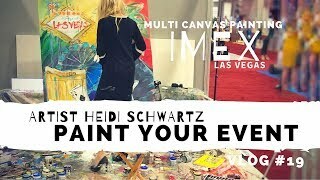 PAINT YOUR EVENT: VLOG #19 Live Painting with Multi Canvas-Canvas at IMEX in Las Vegas! 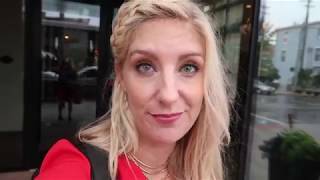 Live painting the epic tradeshow that is IMEX (Worldwide Exhibition for Incentive Travel, Meetings and Events) at the Sand Expo Convention Center and Venetian Meeting in Las Vegas. The Multi-Canvas Canvas: A large canvas comprised of individual, smaller canvases, the whole is taken apart like a puzzle in reverse and the constituent parts raffled off as prizes, incentives, and everlasting keepsakes of an event that was already unforgettable! Each miniature is an abstract, original work of art unto itself. The Multi-Canvas Canvas is a uniquely perfect choice for fundraisers, trade shows, and banquets and galas! Happy New Year’s guys! 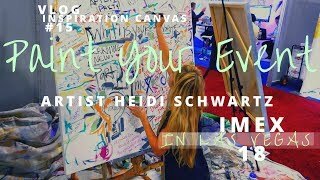 My name is Heidi Schwartz and I’m a live event artist that travels all over the world painting live events. He’s a supersonic speed video giving you a sample of my work looks like. Cheers to 2019! 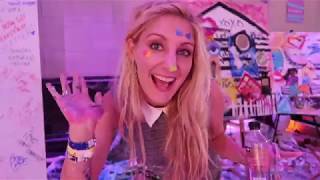 PAINT YOUR EVENT: VLOG #18 Live Painting Sephora's SEPHORiA House of Beauty DAY 2! Painting DAY 2 of Sephora's SEPHORiA House of Beauty event at The Majestic in Downtown, Los Angeles, CA. Two paintings in one day: both works coming from The Inspiration Wall, where guests would pin their answers to questions on the subject of Beauty, combined with variations on the trademark black-and-white lines of the Sephora logo. The occasion was highlighted by an appearance from Chrissy Teigen, there to launch her new makeup line! Painting an outdoor cocktail party on a BRISK night at the gorgeous JW Marriott in downtown Nashville, TN. It was stunning evening where the cold couldn't hold a candle to that VIEW! I was able to incorporate the ever changing Nashville skyline as into the piece. And to top it off the painting was a sweet surprise to the CEO. Check it out and tell me what you think?!?! 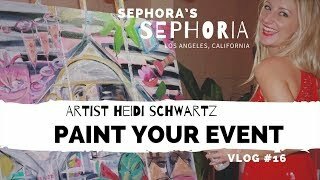 Painting for Sephora's SEPHORiA VIP House of Beauty party at The Majestic in Downtown, Los Angeles, CA might be one of my favorite events I've ever painted. This event was so creative and full of color, that is was a blast to createand capture the essence of the event on the Multi Canvas Canvas! Check it out and see exactly what I am talking about! Painting live multi days at the incredible IMEX tradeshow at the Sands Expo Convention Center and Venetian Meetings in Las Vegas allowed for creating atypical live paintings. 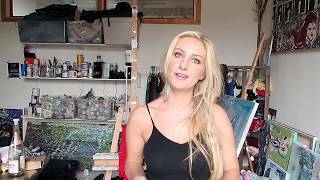 On this vlog I painted the inspiration from the attendee's ideas. Interactive and really creative, one of a kind pieces are born out of collaboration. See for yourself!